Since he moved to Great Neck from New Hyde Park, there have been fewer times when Mitch York gets to see his friend Eileen Caplin Wysel, who owns Bobb Howard’s General Store & Auto Repair Shop on Lakeville Road. But Saturday’s New Hyde Park Street Fair was one of those occasions. Many old customers come up to Wysel’s booth each year to say hello, she said; some even introduce her to their children or grandchildren. “It’s like when you see an old friend — you never remember anything except the good times,” York said. The 22nd annual event drew thousands of people to a stretch of Jericho Turnpike between New Hyde Park Road and Covert Avenue on Saturday. 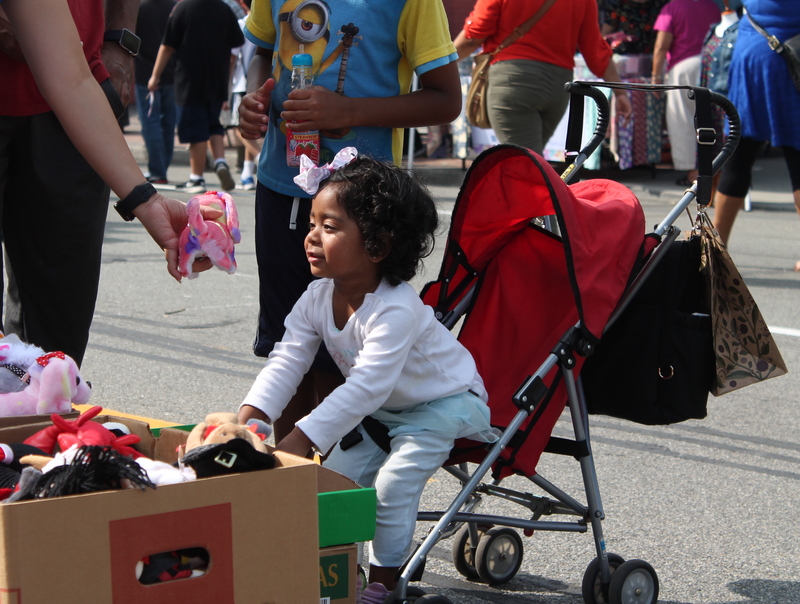 Some 250 local businesses, community organizations and outside vendors lined the thoroughfare, selling food, clothes, toys and other items. Each year’s fair is a chance for people to connect or reconnect with each other and with businesses and organizations they might have forgotten about or never knew existed, participants said. “You see people that you might not see. You’ll see people that you know that don’t know much about the community,” said Sal Balducci, a past president of the New Hyde Park Memorial High School Dads’ Club. A feature new to this year’s fair was live music. Four acts took to a mobile stage on the fair’s west end near Covert Avenue, where chairs were set up for attendees to take a break and take in some songs. This year’s booths included vendors selling everything from posters to purses; local restaurants serving food, including the recently opened Olde Trading Post; and community organizations aiming to raise money, including the Dads’ Club, which funds scholarships for graduating New Hyde Park Memorial students. Northwell Health, the Long Island health care conglomerate, returned as a sponsor of the fair for a third year and set up a “Health and Wellness Pavilion” on Lakeville Road. Also returning was a “children’s carnival” in the municipal parking lot near Central Boulevard, which housed inflatable rides and games. Wysel said she has set up a booth at the fair as long as she can remember. Bobb Howard’s, the store her father founded, has been in business for 70 years. Wysel has seen the fair become more “multicultural” and “multigenerational,” as new residents move in and others who left return with their families, she said. Kumari, and her friends from Bellerose, Anju, Anu and Aakar Panth, said they liked the fair’s street foods best, especially the fried pickles. But they’d like to see a broader variety of cuisine to reflect the community’s diversity. “There are people from different cultures who live around here. … They could add different cultures’ foods,” Anju Panth said.